Hey—here’s a ham radio post for once! High winds (55 mph) blew down the 80m loop. I put it back up, not quite in the same place. We had a pretty windy spring, peaking several days in a row at 55 mph, the highest I’ve ever recorded at my weather station. My poorly-put-up 80-meter full wavelength loop broke under the strain. I took the opportunity to reroute the antenna and fix some problems I had with corner insulators. I really don’t like going up on the roof (it’s a lot further down than up), so hopefully this will last for awhile. I feed the loop with “window line,” 450-ohm impedance balanced line, which terminates at my MFJ-993B IntelliTuner, which in turn sits atop my Ten-Tech Jupiter HF rig. The other antenna shown is an old Radio Shack discone. 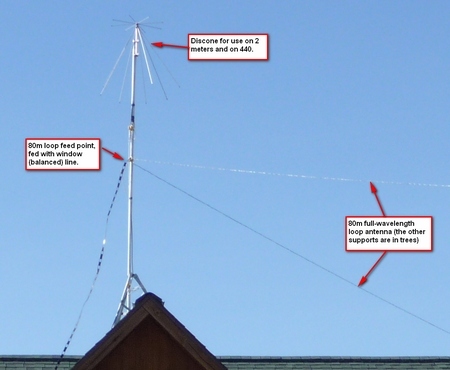 A discone is a broad-band antenna, and this one tunes from 144 MHz on up. A rather strange contraption, but it seems to work. It has about the same gain as a simple vertical.